I love this old saguaro with a seemingly endless number of arms along the Whiskey Bottle Trail in McDowell Sonoran Preserve. I put my backpack beside it for scale (this is my Tom Bihn Guide’s Pack). The pack probably misses the Pacific Northwest where I didn’t sweat all over it but if so it hasn’t said a word and has faithfully carried all my water and other hiking essentials every time I go out. 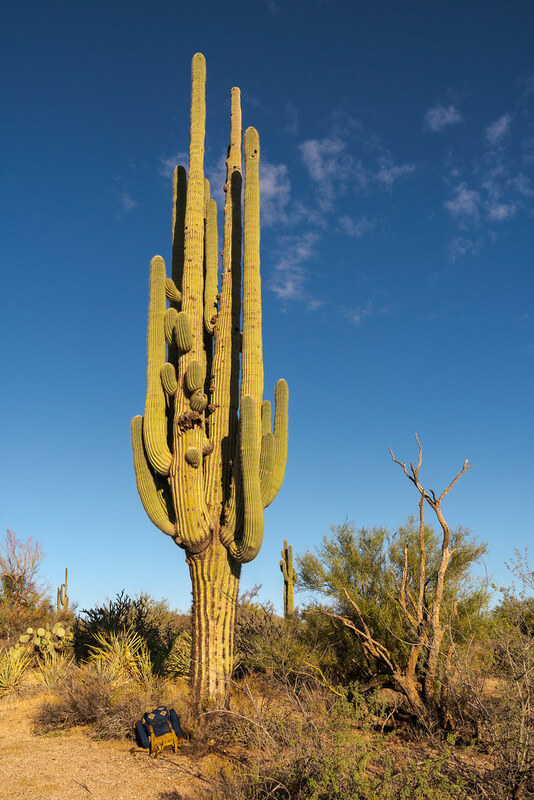 This entry was posted in Plants and tagged Arizona, Brown's Ranch, cactus, desert, McDowell Sonoran Preserve, saguaro, Scottsdale, Sonoran Desert, Whiskey Bottle Trail. Bookmark the permalink.